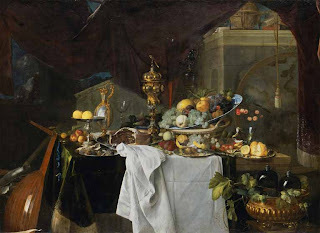 About a week ago, my brother-in-law asked if I knew of any 20th century still-life paintings which "quoted" or were influenced by a still-life from an earlier century. 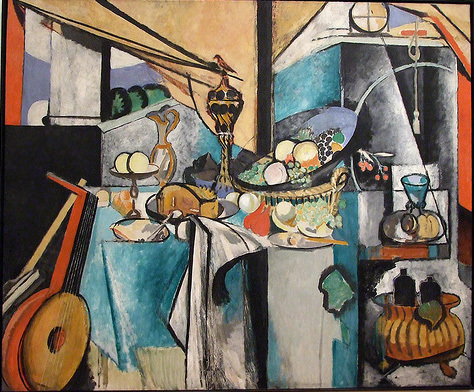 In essence, N was interested in seeing if any 20th century artists had abstracted a traditional still-life beyond recognition. I didn't know of any direct copies/abstractions off the top of my head, but I did come across one example today (thanks to J!). Below is a painting by Matisse, which was influenced by the 17th century painting A Table of Dessert ("La Desserte", 1640, shown on bottom). Although this isn't exactly what my brother-in-law was looking for (Matisse didn't abstract de Heem's still-life beyond recognition), it still is pretty fun. That being said - does anyone know of examples in which a 20th century painter abstracted an earlier work of art beyond recognition?